Harry Potter Talking Sorting Hat and Sticker Book : Which House Are You? With a continual stream of exciting releases from the Wizarding World leading to the launch of the film Fantastic Beasts and Where to Find Them in November 2016, Harry Potter fans young and old are as engaged as ever. Harry Potter Talking Sorting Hat and Sticker Book continues a magically successful program for Running Press. 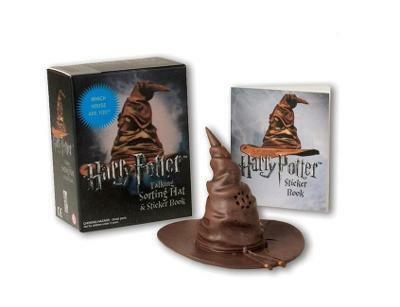 The kit includes a 3-inch miniature replica of the Sorting Hat, featuring voice from the film saying the names of the 4 houses of Hogwarts School of Witchcraft and Wizardry at random so that the consumer can be "sorted," and a 16-page sticker book featuring full-color photographic stickers. * Features voice from the film, saying the names of the 4 houses of Hogwarts School of Witchcraft and Wizardry at random, allowing fans to be "sorted". Audio plays at the push of a button.